SEMINOLE, FL--(Marketwired - Sep 30, 2015) - My Hope Chest, America's only nonprofit offering breast reconstruction assistance for the uninsured and underinsured, just reintroduced the "Official Breast Reconstruction Awareness Ribbon." In preparation for the 4th annual, "Breast Reconstruction Awareness Day," on October 21, endorsed by the American Society of Plastic Surgeons, My Hope Chest debuted the Breast Reconstruction Awareness Ribbon to spotlight uninsured and underinsured breast cancer survivors in need of surgery. "The colors of this unique ribbon transition and transform, just like breast cancer survivors," said My Hope Chest Founder, Alisa Savoretti. The Breast Reconstruction Awareness Ribbon turns from pink, the original symbol of breast cancer, to white, known as a healing power, into yellow, the color of hope and new beginnings. For decades, pink ribbons have been associated with breast cancer awareness, education and research. However, with so much focus on large organizations mistakenly thought to cover every aspect of the disease, the anguish of survivors that have undergone mastectomies to save their lives has been grossly overlooked. It's estimated more than 22,000 uninsured patients undergo lifesaving mastectomy procedures annually, with many left maimed and disfigured. My Hope Chest believes, with decades of survivors, the number that may have given up hope of feeling whole could be in the millions. "We all hope to find a cure for breast cancer," said Savoretti. "But there's a huge population of underserved survivors living with physical and emotional scars that are a constant reminder of the disease. As a result, many feel less than whole, and are unable to heal completely and move past their cancer journey." My Hope Chest deems October Breast Cancer ACTION month and supports funding grassroots efforts for the underserved need of breast reconstruction and education. Their mission focuses on the Celebration of Life and closure from the disease in body, mind and spirit. "When we see more advocacy and funding to help those who are left without reconstruction surgery as an option, we'll create awareness where it's needed and make a difference for this silent epidemic," stated Savoretti. "That's why My Hope Chest created the Breast Reconstruction Awareness Ribbon and we continue to share it annually." More information: (727) 488-0320 or http://www.myhopechest.org. 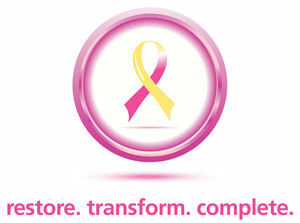 My Hope Chest is proud to have created the ribbon for Breast Reconstruction Awareness. The Awareness Ribbon supports uninsured and underserved Breast Cancer Survivors.